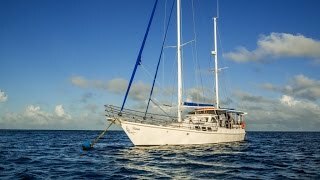 Sail and Dive the Outer Great Barrier Reef and Whitsunday Islands on their 16.4 metre ketch and enjoy your first dive for free. Kiana is the only vessel in the region that caters for small numbers to the outer Great Barrier Reef. Below decks is fully air-conditioned and fitted out for maximum comfort for 14 passengers. Enjoy the comfort of Kiana’s large saloon area and private cabins. Above deck there’s lots of room for gearing up to go diving, snorkelling or relaxing in the sun. Explore, dive or snorkel the incredible diversity of the islands and outer Great Barrier Reef. This trip offers great opportunities for both certified divers and first-timers. Scuba diving amongst the coral playgrounds of the Great Barrier Reef is a prime focus on board. You will also spend a fun time in the clear shallow waters of world famous Whitehaven Beach and take a walk up to one of the regions highlights being Hill Inlet, admiring the swirly sands below. Their skipper, hostess and dive instructor will ensure you enjoy the best of both worlds. Sailing and diving by day with great food and a relaxed atmosphere in the evening. Below decks is fully air-conditioned and fitted out for maximum comfort for 14 passengers. Enjoy the comfort of Kiana’s large saloon area and private cabins. Above deck there’s lots of room for gearing up to go diving, snorkelling or relaxing in the sun. Explore, dive or snorkel the incredible diversity of the islands and outer Great Barrier Reef. This eco-accredited trip offers great opportunities for both certified divers and first-timers. Scuba diving amongst the coral playgrounds of the Great Barrier Reef is a prime focus on board. You will also spend a fun time in the clear shallow waters of world famous Whitehaven Beach and take a walk up to one of the regions highlights Hill Inlet, admiring the swirly sands below. Their skipper, hostess and dive instructor will ensure you enjoy the best of both worlds. Sailing and diving by day with great food and a relaxed atmosphere in the evenings.